"Deep Purple played a sold out gig on March 7th at PalaRaschi in Parma (Italy), in front of almost 4,000 people. The setlist was: Intro / Pictures of Home / Things I Never Said / The Battle Rages On / Strange Kind of a Woman / Rapture of the Deep / Fireball / Wrong Man / Steve Morse Solo ~ The Well Dressed Guitar / When a Blind Man Cries / Lazy / Kiss Tomorrow Goodbye / Don Airey Solo ~ Perfect Strangers / Space Truckin' / Highway Star / Smoke on the Water. Encore: Hush (Ian Paice solo) / Black Night (Roger Glover intro). The written set list included "options" of Into the Fire (I think they played it in Albania, March 4th, instead of "The Battle Rages On"), Vavoom: Ted the Mechanic, and Sometimes I Feel like Screaming. Ian Gillan was apparently feeling a bit ill after the show, which was why he showed late backstage. But he was very kind with all the fans waiting for him. 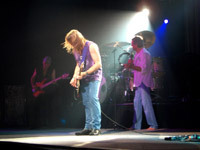 Steve Morse is doing two guitar shows, one in Rome and another in Palermo (Sicily)." Two very atmospheric shots from Deep Purple's show in Palermo. Open them up and it feels as if you're there! According to Deep Purple Italia a new Deep Purple date has just been confirmed by promoter Barley Arts, on the back of a successful stint in Italy during March. In all they played five dates, including a sell-out in Parma, and four in the more seldom visited south of Italy. The new date is May 5th 2007 - Palasport - Genova. Tickets went on sale on Monday , March 26th, from www.ticketone.it. Prices: 25, 30, or 35 euros (plus booking fee). "They were good without big surprises in the set list except for 'The Battle Rages On', and that was a very good choice. They played it slower than the original version... very impressive.I loved it !!" "The venue in Beauvais was the Elispace. The other acts named in the poster are not DP's support acts but appear on earlier nights during the festival. By the way, the screens at each side of the stage are back but the Rapture backdrop (and merchandise and most of the tracks) has gone. They're still selling bananas though. What I think is the current Euro tour t-shirt uses that awful image of the band in flames (with Jon) used originally in Australia." 14 Nov Châteauroux / 15 Nov Toulon / 16 Nov Perpignan / 18 Nov Paris Olympia / 19 Nov Liège [Belgium] / 21 Nov Le Havre / 22 Nov Angers / 23 Nov Brest / 25 Nov Le Mans / 26 Nov Orléans / 27 Nov Angoulème / 28 Nov Besançon. photos: Arnaud Delrot . Click to enlarge.